Tribes Overall: " Wonderful experience. Saw so many interesting/amazing/delightful things, and learnt so much local history. I really enjoyed the variety of hotel/lodges/camps. " Tribes Service: "Friendly, helpful, and knowledgeable." 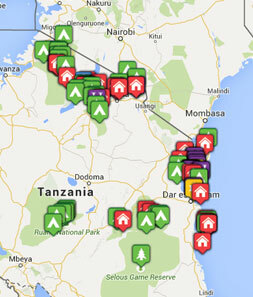 Guides: "Tanzania guide and driver, Peter, very conscientious. Spent much time on the phone trying to get my suitcase reunited with me. Zanzibar Stonetown guide flexible, very interesting and knowledgeable. Spice tour guide, good fun. " Social & Environmental Responsibility: "I felt that I was helping to support local people through employment, buying locally made goods, and services, and supporting local initiatives like hand made bags which raise money for orphaned girls." Approached this with caution as a hotel/motel person, but I could have stayed there for ever! The staff were EXCELLENT PLUS!!!!!!!!!!!!! The ambience was amazing, a bit tired in places; some of the staff a little lack lustre, and disinterested. "Watching hyenas feast on a kill while the vultures hung about waiting for leftovers - gory but fascinating! Olduvai Gorge museum Hippo pool in the crater Posing for photo with Masai in my Masai blanket which I wore when I washed my one and only set of clothes after my suitcase did not arrive with me on safari. Coffee with the owner of Livingstone's cafe (where Livingstone and other explorers stayed) in Stonetown, near the sea in beautiful, balmy weather. New Year's Eve in the roof top restaurant of Swahili House with church bells ringing, and ships' sirens sounding. Lunch under an acacia in the middle of the Serengeti with NO ONE around. The quiet, the warm breeze, the peace."